The beginning of July Jim and I applied for the Global Entry Program, which is offered by the Department of Homeland Security in the United States. The goal is to enhance security and increase system-wide efficiencies while improving the passenger experience. They offer different levels of programs, but because we travel within the U.S. as well as abroad, we chose the Global Entry selection. The bottom line for us as travelers is that we will always get TSA Pre-check when flying in this country (no more removing shoes, light jackets, laptops from bags, or small liquids from carry-on bags), as well as expedited processing through Customs at airports and land borders when we return to the United States following international travel. The process begins with online enrollment in the program, and the payment of $100. They keep the money if you are not approved for the program, but if you are successful then your membership is good for 5 years. On July 8th we received notification that we had been preliminarily approved, and that the next step was to set up an interview at one of their enrollment centers. You must set up the appointment within 30 days of the date of the notification letter, though the interview does not have to take place within that time period. 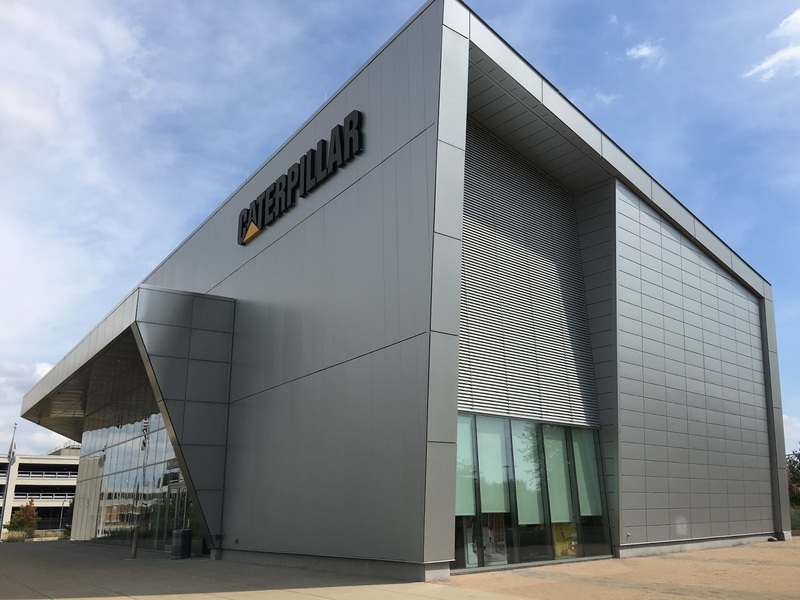 And that is a very good thing because the enrollment center in St. Louis, which is located at Lambert Airport, had no openings until late November! At the time we applied we thought (wrongly, as it ends up) that we were going to be spending November in Australia, thus the desire to get into this program. I checked other locations to see of we could get an earlier interview and the only place I could find within a reasonable driving distance was Peoria, IL, which had openings on September 21st. Knowing that it would take us nearly three hours to get there, I set our appointments up for 11:15 and 11:30 in the morning. A caveat is that the confirmation letter we received stated that the agent has other responsibilities, and thus might not be available when you arrive. For that, they apologize. No big deal if you are from the area, but a pretty big consideration when you are traveling a distance. We decided to go for it. We arrived at 10:45, and were relieved to see a Department of Homeland Security vehicle in the parking lot. The agent was all alone when we entered the building. I explained that we were early, and he asked what time our appointments were scheduled. After I told him, he said "Well let's get this done before 11." He no sooner uttered those words when his 11:00 appointment came in the door. He told her he would be with her after he finished with us. For the appointment you were asked to bring a copy of the preliminary approval letter, your passport, a driver's license, and a utility or other bill showing your address. He asked to see all but the last item, and asked us both questions that had been answered on the original application. I think they want to make sure you answer the same way. I had read that they ask you where you have traveled in the past, whether you have ever been stopped by customs, if you have ever brought anything illegal back into the country, etc. I prepared a detailed list of all of our international travel, just in case. Our agent only asked where we were planning to travel in the near future. Again, we had answered this on the application. We had to place our fingers and then our thumbs on an electronic device, which took our fingerprints. No more paper and ink! When the results came back with no red flags, he aimed a hand held camera across the counter at my face and snapped a picture. All with less warning than the driver's license office. You can imagine how it turned out. It makes my license look like a Glamour Shot in comparison. Nevertheless, we were both approved and finished just before 11:00. The lady after us drove there from the Quad Cities, so we weren't the only ones traveling a distance to get this done. Since we had made the drive, we decided to see a little of Peoria. On the recommendation of the agent, we first had lunch at Thyme, a fun restaurant with an interesting menu and a decor to match. Jim said it looked like Pinterest had exploded inside the building. It was quite good, and we enjoyed our food. From there we headed down the street to see the Sculpture Walk, a series of 16 sculptures that are on display for a year. 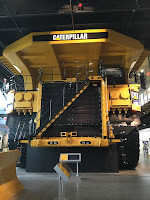 This led us to the Caterpillar Museum, and we decided to go inside. We had purchased several pieces of their equipment during our time of owning the composting facility. 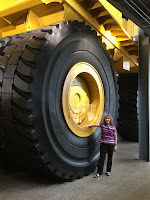 It is an excellent museum, and the docents are friendly and knowledgeable. 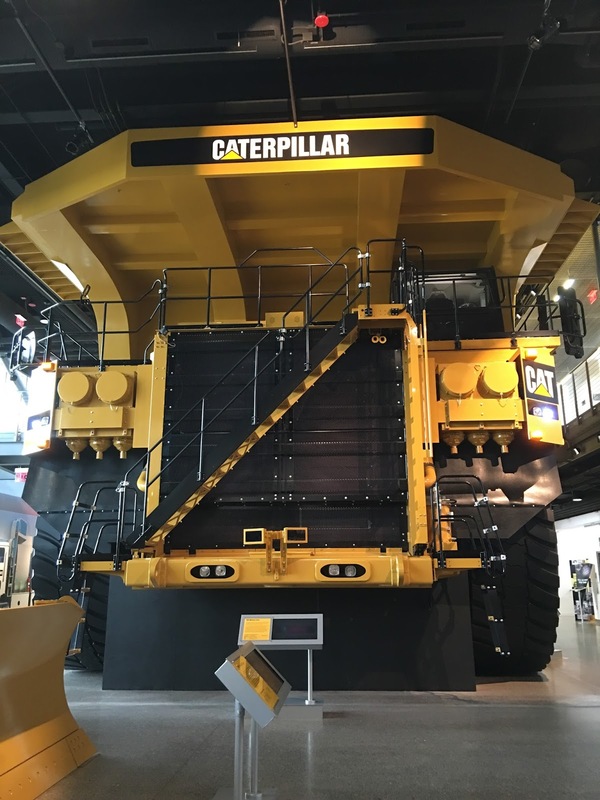 All the ones that we talked with were former Caterpillar employees. By the time we got out of the museum a storm was blowing in so we were unable to see the sculptures on the other side of the street. 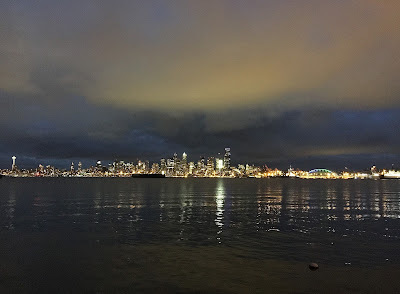 That was too bad, but we were happy to get out of town before the storm hit. 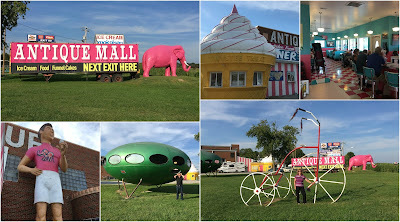 The weather cleared as we drove back home, which gave us an opportunity to stop and see this roadside attraction. We had driven past many times on our way to Chicago, and always thought it would be interesting to experience. You can get your kitsch on Route 66 here! We had dinner at the diner, which certainly took us back in time. The chocolate ice cream machine was broken, but that was the only negative to the visit. What a fun day! 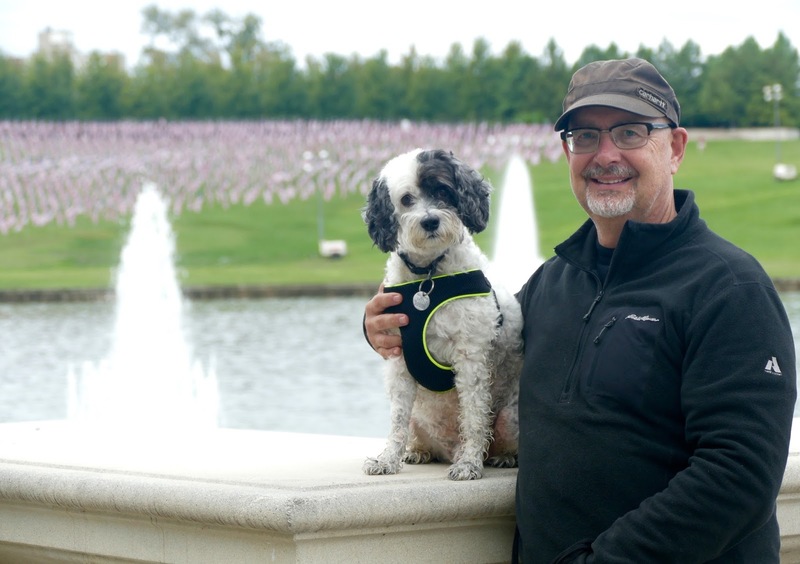 On Thursday the 22nd we took Kirby to see the oncologist, Dr. S. It was our first visit to Veterinary Specialty Services, a clinic filled with board-certified veterinary specialists. So basically every animal that comes in there is in some sort of a crisis situation. I filled out the paperwork, and we had a short wait before the vet could see us. We found Dr. S. to be a no nonsense type of person, but with a wonderful bedside manner. We discussed Kirby's surgery and the pathology reports, and she suggested doing an ultrasound to see if there were any additional tumors in the belly area. If he was loaded with tumors then followup treatments would not make sense. We agreed that was a good starting point. They took him in the back, shaved his tummy and did the test. It was questionable whether they would have to put him under for the ultrasound, but in the end a muzzle took care of the issue. We met again with Dr. S., who said that the good news was she did not see any new growths. She also did a needle aspiration on a lump on his leg, and that was just one of the many fatty growths he has on his body. Her recommendation was to do chemotherapy, whether through pill form or IV. That would be up to us. She explained that she hates mast cell cancer because it is so unpredictable, and the fact that he had it in a lymph node was very troublesome. We discussed the pros and cons of the pill versus IV therapy, and honestly my biggest concern at the time was that the pills are very dangerous to humans. You have to wear special gloves when you handle them. It makes sense to me to have them administer the IV in a controlled setting where they know what they are doing. The treatment would involve going in once a week for four weeks, and then every other week for four additional treatments. So three months, essentially. The pills, on the other hand, would be administered every other day for three months. Whichever way we go, Kirby's saliva, urine and feces will be toxic to us and other animals, so we'll need to exercise caution with that. His immune system would be compromised either way, and he would not be allowed around any other animals. Not even at the groomers. After further discussion, we set up the first IV treatment for the next day, Friday the 23rd. At 4:00 in the morning on Friday, Jim and I were both wide awake and fretting. I could not stop crying, worrying about whether or not we were making the right decision. We finally decided that if we were both concerned, then we should listen to our guts. We are not impulsive people who make major decisions without looking at all the facts and options, and I think that was part of the problem for us both. I called and cancelled the appointment, and asked for Dr. S. to call me. She returned my call a few hours later and answered all of my questions to the best of her ability. Basically, mast cell cancer cannot be cured. It will come back in Kirby, so it's not an "if" but a "when" situation. What you are hoping to accomplish with chemo is to destroy or disrupt the mast cells that have gone rogue in his system. Unfortunately there are no good statistics to help with the decision. It's not like she can say if you give him chemo, he can live for another 2-3 years. Or if he doesn't get chemo he will die in 3 months. If he was five instead of going on eleven, that would make the decision easier. We have since talked to a couple of people that worked in clinics that treated dogs with cancer, and they both said most dogs handle the chemo better than a people do. But all I can think is, if he is one that gets really sick, how in the world do I get his toxic waste out of hardwood floors and tile grout? Would he have to be kept in a kennel? Can we even take him on any walks if his waste is hazardous to other animals? Lots of questions and no easy answers. At the moment, we are doing nothing other than keeping him on the medications he has been on since surgery - Benadryl twice a day, a Pepcid AC cut in half twice a day, and an Apoquel once a day. The mast cells release too many histamines in the body, causing itching and a chance of damage to the stomach lining, so these drugs help to keep that in check. I am taking him tomorrow for his grooming, which we do every two months and he is due for that. And Jim's parents want to see Kirby while he is still feeling good, so the two of them are going to do a road trip soon. Then we'll have to make an executive decision on which was to go. It is hard because Kirby has no say in this whatsoever. What decision would he make??? When I saw my dermatologist (Dr. S.) in late July for my normal (if anything about my skin can be considered normal) six month check-up, I mention that a spot on my upper right chest had not responded well to the cryosurgery he had been doing on it each time I came in. He said it was time for me to see the plastic surgeon again. I would say it was past time, actually. I rely on him to tell me when it is time to get things surgically removed, but in light of recent developments I can see that I will have to be more assertive. Dr. S. then proceeded to burn about 13 spots on my head, chest (including two above the spot I believed to be skin cancer), back, shoulders and arms, and I booked an appointment with the plastic surgeon (Dr. R.) Between his schedule and the trip we had planned to Seattle, I could not get the surgery done until September 16th. There was some pain that afternoon and a little on Saturday, but nothing like when I had the two removed from my forehead earlier this year. 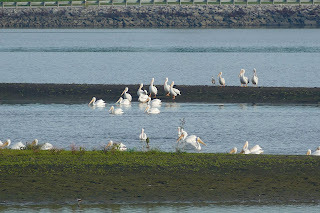 In fact, I felt good enough to go and photograph migrating pelicans with my friend Sunday morning. Unlike any incisions Dr. R. makes on my forehead, these two incisions were covered with bandages so I didn't need to worry about clothes rubbing on them or dirt blowing in them. I have to wait for the bandages to come off on their own, and am not supposed to be doing any exercise or movement that may stretch the incisions. The biopsy reports came back that the ones on my chest were basal cells, but the small one on my shoulder was just a mole. That surprised me, as I have many moles and none of them look like that one did. But I would rather err on the side of caution at this point. In light of the exercise restrictions, it was a good thing that I scheduled my surgery for after the Silver Games in Washington, MO. 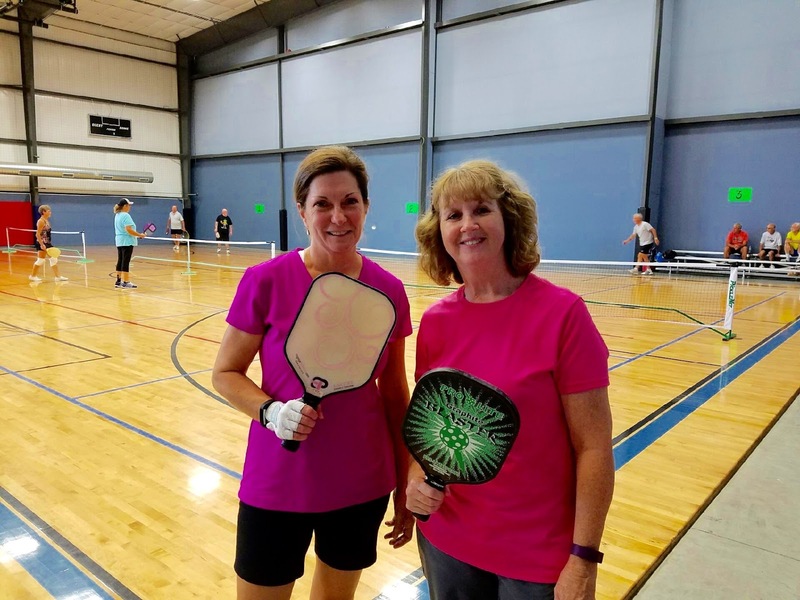 I played in my first pickleball tournament on September 14th, playing ladies doubles with my friend Audrey and mixed doubles with my friend Leon. In both cases we only won one game out of three, but we had a lot of fun despite the disorganization of the tournament. We arrived at the sports center at 12:00, and games were supposed to begin at 12:30. In fact, they did not begin until 1:00, and Leon and I did not finish our last game until 10:00 that night. Frankly, by then we did not really care if we won or loss. 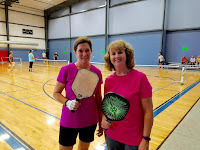 But it was still pretty fun to hang out with many of my pickleball friends for the day. 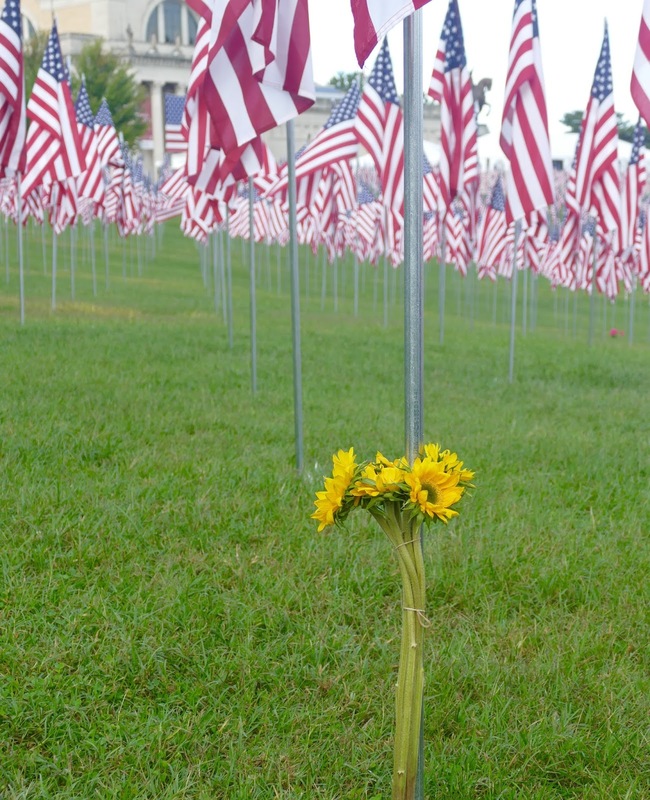 September 11, 2016 marked the 15th anniversary of the terrorist attacks on America. Like many people, I can remember exactly what I was doing when the first plane hit the World Trade Center. I was eating breakfast and watching The Today Show, which was unusual for me. When they showed the footage of the plane, I thought that the pilot had made a grave error. As I watched live while the second plane hit the other tower, I knew we were under attack. 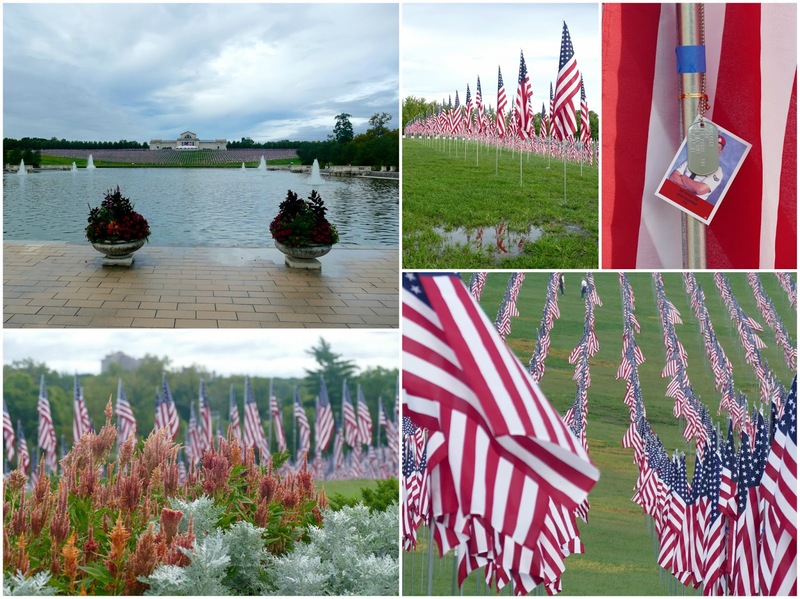 Each year on 9/11 communities around the country honor the memories of those who died that day, and St. Louis is no exception. At Art Hill in Forest Park a group called America's Heartland Remembers organized a display of over 7,000 flags, paying tribute to the military men and women who have died fighting the War on Terror since the 9/11/2001 attacks on America. The flags were placed in chronological order by date of death. Attached to each pole were a photo and dog tags of the soldier who died. 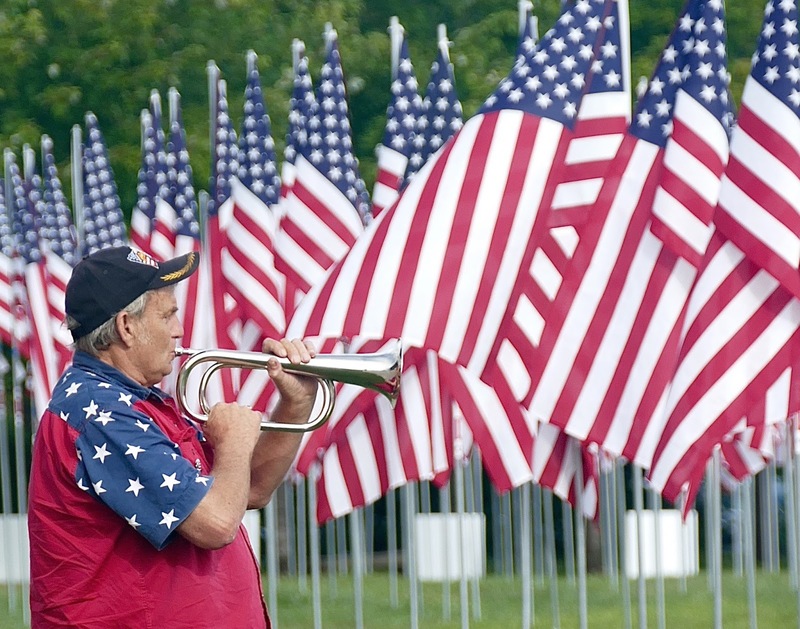 The sight of all these flags, the eerie sound of the dog tags chiming in the breeze, and the veteran playing taps all brought into perspective how devastating this war has been. 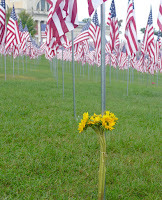 As I was photographing this flag with the yellow flowers at its base, a woman moved beside me and began to cry. 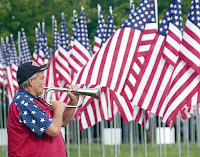 That flag stood for her nephew, one of three flags that held photos of young men she knew personally. As they were grouped together, I imagine that they died in the same conflict. My tears joined hers as I grieved for all these young men and women who would never have the opportunity to live long, full lives. I gave her a hug, expressed my condolences, and prayed for the families of these fallen soldiers as well as those still fighting to keep America free. We are blessed in so many ways in this country, and it is because of people like these soldiers that we can continue to count our blessings each day. What a fitting way to honor them. Switching subjects, I'll give a quick Kirby update. He had his second followup visit with Dr. M. last Thursday. The vet felt like the incisions were healing well, and he did not feel any new lumps in Kirby's abdomen, which is great news. Kirby also gained back an additional pound, so that was positive as well. Dr. M. asked if we had decided what to do about seeing an oncologist, and I told him that Kirby is scheduled to see Dr. S. on the 22nd of this month. I said we want to know what to expect with mast cell cancer, and also see if any additional treatment makes sense at this point. Other than that, Kirby is eating and sleeping well, and we are back to our three walks a day. We are hoping he is one of the good statistics! 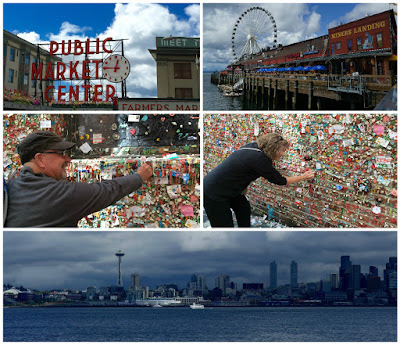 We recently spent six days in Seattle. The main purpose of the trip was to attend the wedding of the son of some friends from college. The dad was in our wedding and Jim was in the dad's wedding, so we go back 42 years. Man, we must be old! We had also attended the wedding of their older son at the Air Force Academy chapel several years ago, and at that time the G's rented a house and ten of us stayed there. Some of us had never met before, but the whole group got along like we had known each other for years. 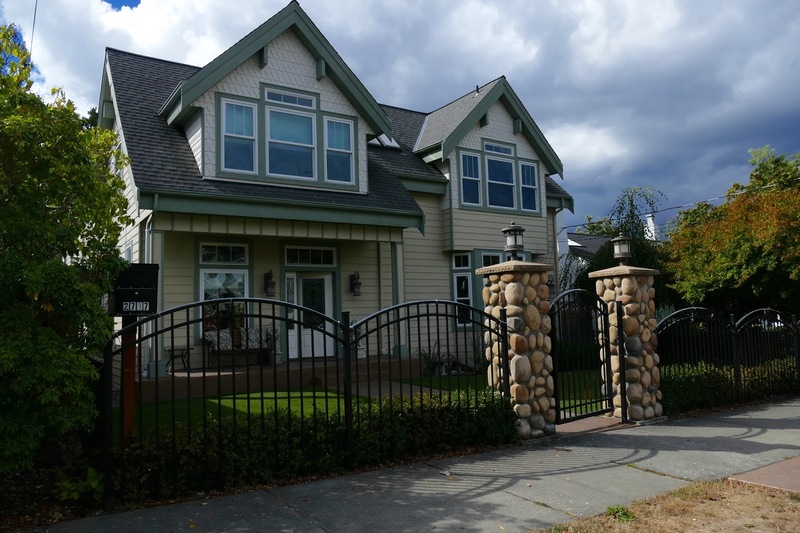 So the G's rented a house in Seattle this time as well, with most of the original ten cast of characters making a repeat appearance. Located two blocks from Alki Beach, this house was unbelievable and a great place to be the base for the wedding. There was easy access to mass transit, and fun shops and restaurants were within walking distance. 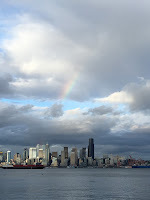 The day of the wedding began on a rainy note (it was Seattle, after all), but once it cleared a group of us took the water taxi to downtown Seattle to check out the Public Market Center since the ceremony did not begin until 5:00. We, of course, had to make a contribution to the Gum Wall, noted as one of the top five germ-filled attractions in the world. 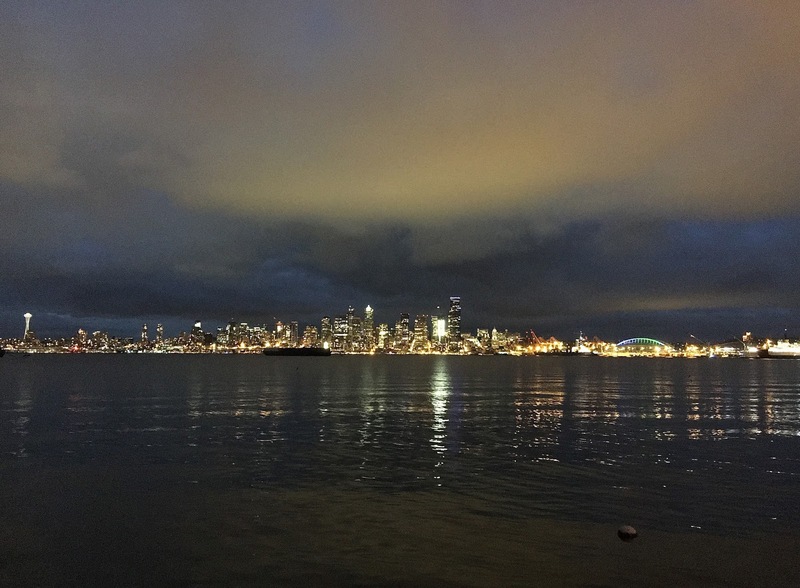 The wedding was nice, and the reception was held at a restaurant on the beach with a great view of Seattle. 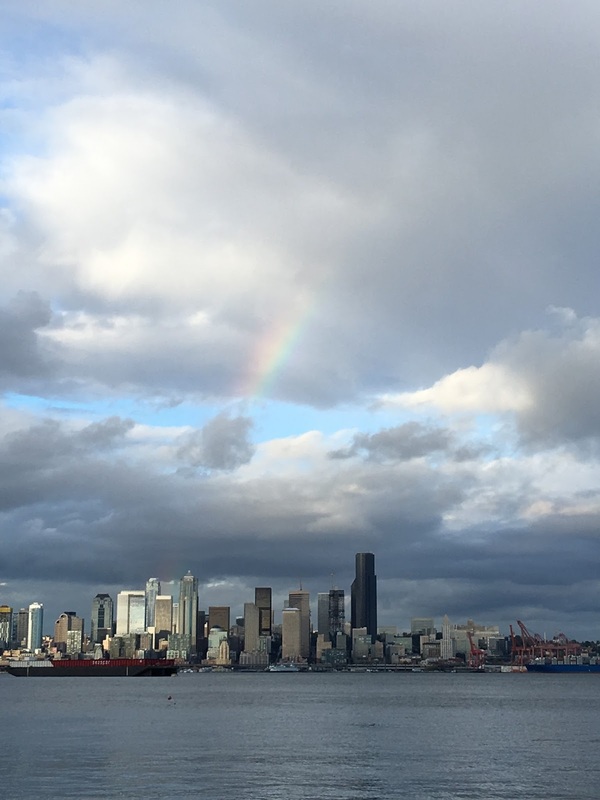 A rainbow even appeared during the reception. If that isn't a positive sign for the bride and groom, I don't know what is. We had fun toasting the bride and groom, and dancing the night away. As the bride is from the northern Kentucky/Cincinnati area, I enjoyed meeting the family and guests from her side of the family. Saturday morning the bride's mom and dad had us all over for brunch (I think there were 80 guests!) at their circa 1911 home. I cornered the mom for a bit as she does genealogy, and their family name is also in Jim's family tree. Wouldn't it be something if they are related? Following the brunch some of us went to see the Chihuly Garden & Glass exhibit. Oh my! I have been a fan ever since the Missouri Botanical Garden showed his work many years ago. What a treat to see his beautiful pieces of art in the area of the country where he was born and raised. 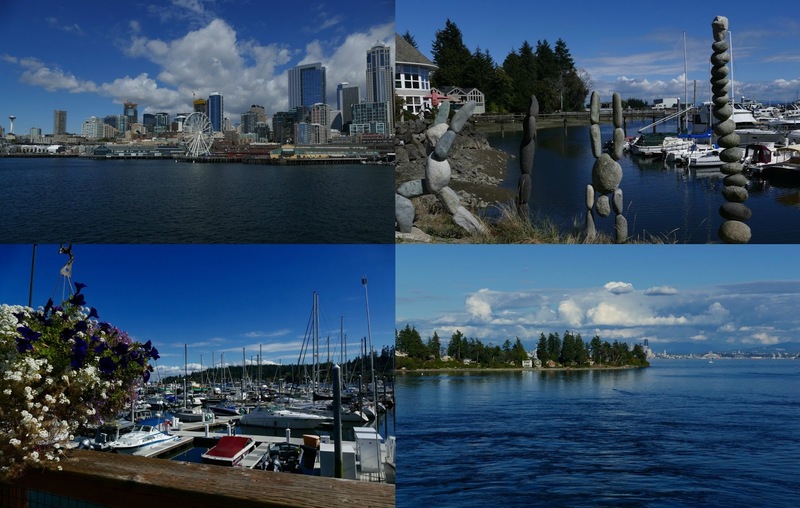 On Sunday it was back on the water taxi to Seattle, this time to board a ferry to travel to Bainbridge Island. By the time we waited for the ferry to unload, then load up all the cars and people, and then travel to the island, it was time for a late lunch. Since it was a holiday weekend with beautiful weather and we wanted to dine outdoors, that pretty much blew all of our time on the island. We got to see a bit on the walk to and from the ferry to the town, but that was about it. As it was overcast on Monday, a visit to the Boeing Flight Museum seemed like good option. 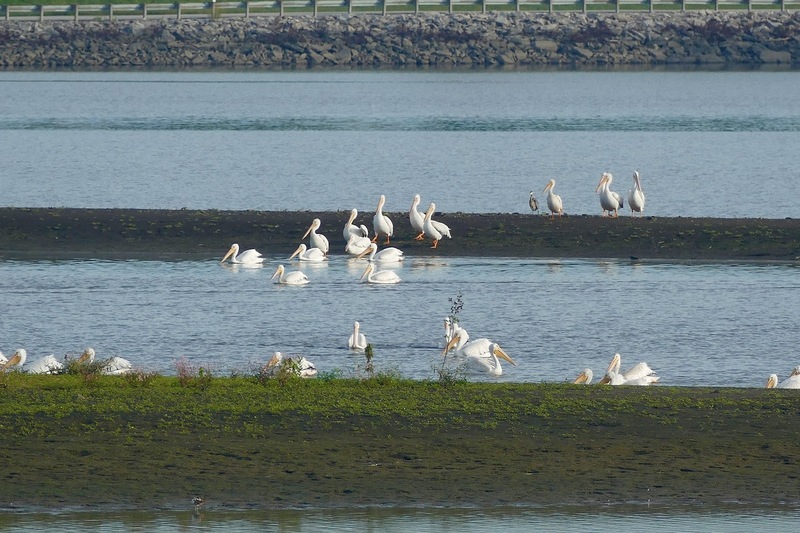 One of the couples had already taken off for the next part of their vacation, so eight of us went on this excursion. 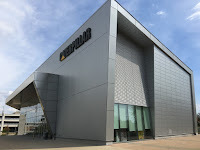 The museum is huge, multi-faceted and very interesting. The one young person in our group, who is a pilot in the air force, got Jim into one of the flight simulators. There was a lot of rolling going on, but Jim still managed to rack up six kills as the gunner in the plane. I was content to take pictures and video of them. 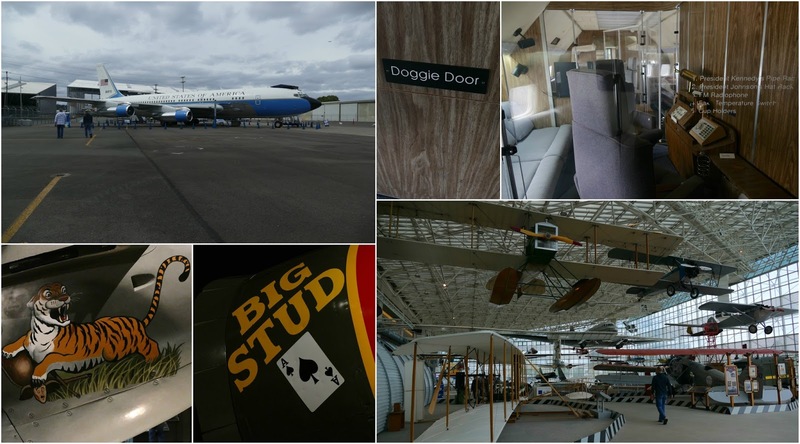 It was particularly interesting to see the SAM (Special Air Missions) 970, the first Presidential jet plane. It was delivered in 1959 for President Eisenhower, and remained in service until 1996. I loved that there was a doggy door in place! 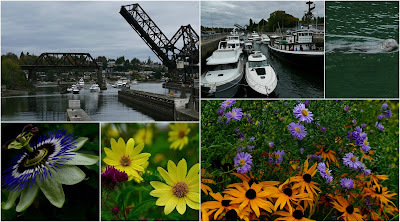 Before meeting back up with the others for dinner, three of us went to see the Hiram M. Crittenden Locks (also called Ballard Locks by locals). Completed by the Army Corps of Engineers in 1917, the locks connect Lake Washington, Lake Union and Salmon Bay to the tidal waters of Puget Sound. It was fascinating to watch the water levels rise and fall to move the boats from one area to another. What a time-consuming process! 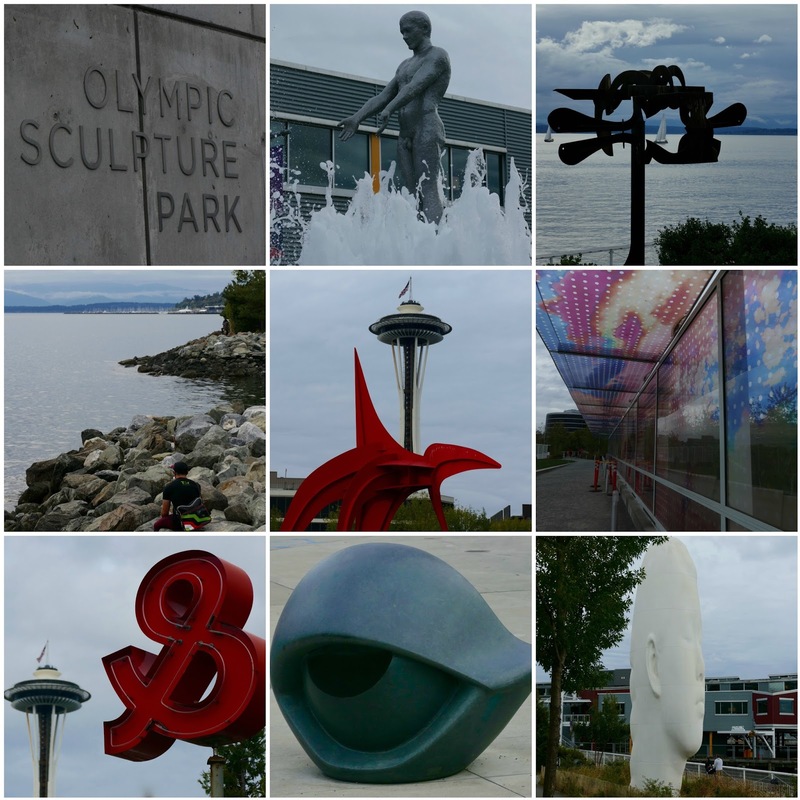 As we were driving back to West Seattle, we noticed Olympic Sculpture Park along the way. Since Jim knows the firm that was on the design team for the park, we had to stop. 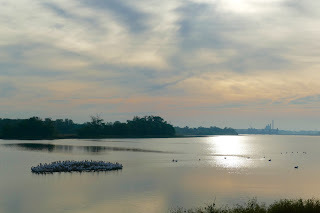 I wish we would have known about it sooner as it was a wonderful place to walk, see nice views and enjoy the sculptures. By Tuesday nearly all of us were on the way back to our respective homes. 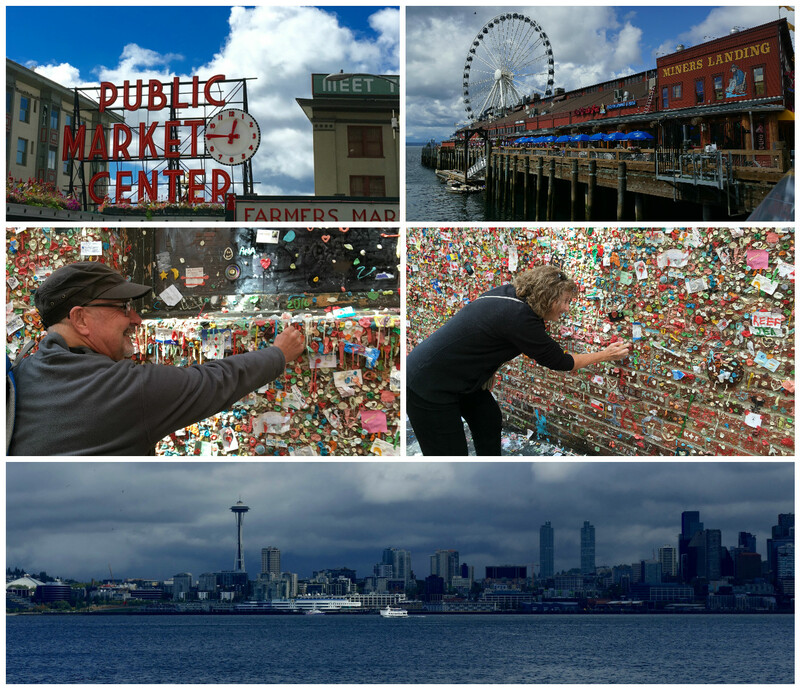 What a wonderful time we had rekindling friendships and seeing part of what Seattle has to offer.